Beer Battered Bacon... a thick cut piece of bacon - dipped in beer batter and deep fried. It's great with ranch or barbeque sauce! Where can you find a bacon cheeseburger served not just on a regular bun, but squeezed juicily between two glazed doughnuts? Where can you get a deep-fried turkey testicles served with fiery hot sauce? The food you may never find anywhere else is making appearances at The Great State Fair of Oklahoma, and this year, adventurous food warriors can try everything from beer-battered deep-fried bacon to a deep-fried bacon brownie to frog legs and alligator on a stick. This isn’t your average gastro experience. Armed with as much imagination and deep-frying grease as you can imagine, food vendors at the 2012 Great State Fair of Oklahoma are offering the usual favorites like corn dogs and funnel cakes to the weird, the unique and the downright terrifying. “It’s hard to quantify exactly the attraction value of our illustrious fair food to our fairgoers; however, we do think it would be fair to say that practically every person who comes to the Fair is looking forward to trying at least one tasty treat, even if that’s not the primary focus of their visit,” said Dana (Palmer) Murrell, director of Sales and Development for Oklahoma State Fair, Inc. According to Oklahoma City resident Kyle Golding, anything deep-fried and on a stick is going to be good. 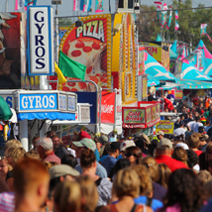 Those with a less adventurous stomach can still enjoy the wide variety of favorite eats at the fair. The Good Life Hospitality Group of Oklahoma will serve such foods as pot roast sliders, shrimp corn dogs and other snacks at the new Oklahoma State Fair Wine and Beer Garden, which is located in an upscale and landscaped area of the fair. The Good Life Hospitality Group owns the Norman eateries of Blu, Coach’s Brewhouse, Blackbird Gastropub and The Library. The Grand Slam Grill will serve up Cajun favorites like bourbon-glazed bread pudding and gumbo, while Tolleson’s Burger and Chili Shack will return with the Famous Juicy Lucy Burger, which was featured on the Food Network. Be prepared for a cheesy overload however, as this burger is made with an overload of American cheese oozing between two thin beef patties. Anything a fairgoer could imagine being deep-fried can be found at the fair. Oreos, manicotti, peaches and cream, bacon dogs, cookie dough, peanut butter cup sandwiches – yup, they can all be found deep-fried and oozing with sin. Are you a stick jock? Lucky for you, you can find deep-fried cookie dough on a stick from Aunt Edmoe’s Cookies, alligator on a stick from Layne Concessions, battered and fried jalapeno pepper on a stick from Onion Blossom Concessions, Cajun sausage on a stick from Grand Slam Grill, deep-fried bacon-wrapped chicken on a stick from Fire and Ice Concessions, a deep fried cinnamon roll on a stick from Sweet Shop and deep-fried mac and cheese, manicotti and mashed potatoes on a stick from Diventuri Concessions. Everything goes better with bacon, so they say. Those who follow that mantra can bacon themselves to oblivion with everything from frozen chocolate-covered deep-fried bacon to a bacon smoothie (perfect for breakfast! ), bacon brownies, bacon dogs, bacon chocolate milkshakes and bacon cinnamon rolls. “The selection process for food vendors and non-food exhibitors is by submittal of an application which includes photos of the proposed set up, proposed menu items and history/references/experience with other events,” said Murrell. Fair food has changed from the days of yesteryear. American fairs started in 1810, according to the Oklahoma Historical Society, by agricultural societies whose members discussed crops, livestock and land use. The main purpose was to educate farmers, but in the1840s, manufacturers began using fairs to exhibit new plows, planters and reapers. The food offered at these fairs usually came from the farmers showing off their crops. The staples at the turn of the century were salt water taffy and cotton candy, but one traditional and common food we’re all familiar with was actually “born” at a state fair. The Cornell Chicken, associated with the New York State Fair and Cornell University, debuted in 1946. These chickens were created to encourage Americans to eat more chicken because in the 1940s, chickens were mainly kept for eggs. But the Cornell Chicken was only 2-/12 to 3 ½ pounds, and the “broiler” chicken was born. Today, broiler chickens are among the most popular grocery items available for families. At the Oklahoma State Fair, much remains the same, and early fair food also included taffy, cotton candy and farm food, but records are hard to come by. “Although I feel certain it’s getting much more ‘creative’ with each passing year and decade,” said Murrell. The fair will offer a coupon book this year, The Little Book of BIG DEALS. This book features a combination of both food and non-food deals that can be found at the fair this year, but offers are only good with a coupon. For more information about The Great State Fair of Oklahoma, visit okstatefair.com.